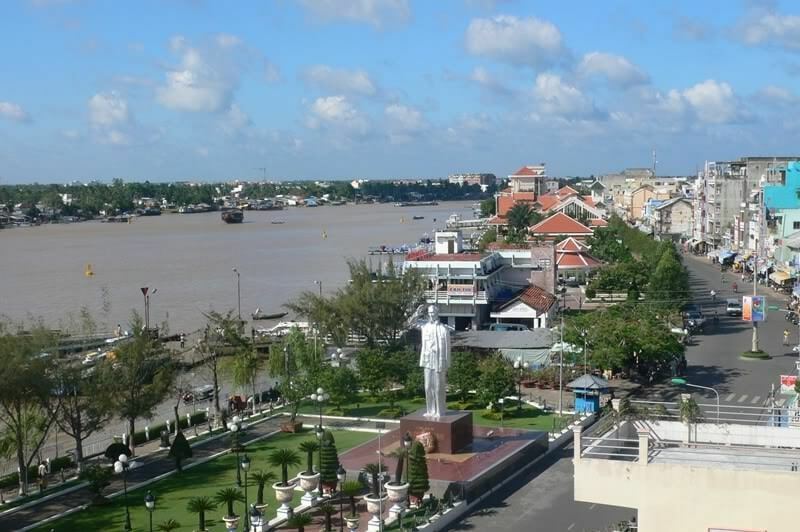 Can Tho City is located in the downstream of Me Kong River Delta, in the center of Cuu Long River Delta, about 1670 km from Ho Chi Minh City. This city is on the land was alluvium from Me Kong River from year to year. 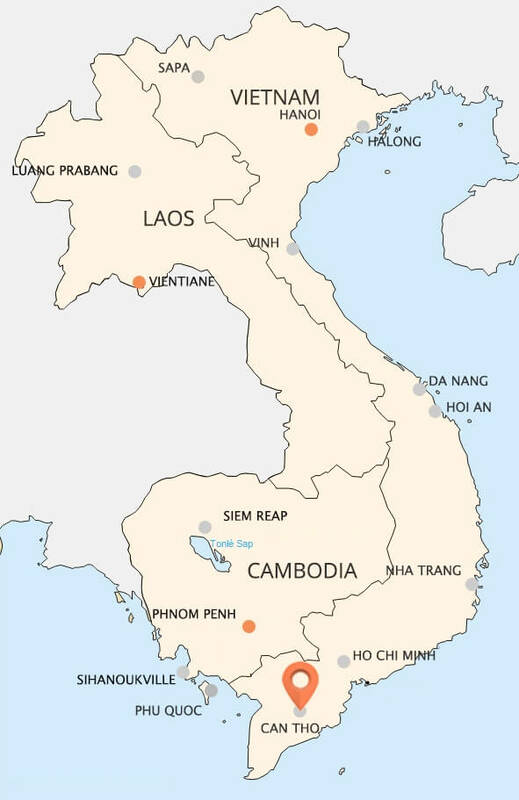 Can Tho is located in the tropical monsoon climate, few storms, hot and humid all year round, no cold season. 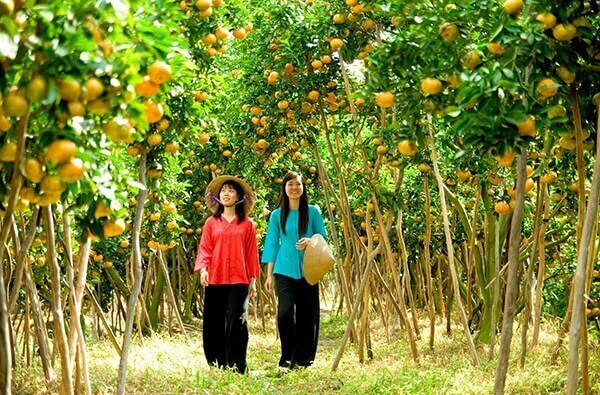 The advantages of climate are favorable for the growth and development of organisms, can create one system of tropical agriculture with high yield, with many species of plant, make up the diversity in production and in production restructuring. The intertwined rivers system of Can Tho makes it like "Regional Water River City" with vast fruits gardens, wide paddy fields, isles as: Tan Loc dunes, Son dunes, Khuong dunes, Au dunes... bobbing on Hau river. It is a very unique beauty to develop tourism. So that, Can Tho alsway plays an important part in the tourism industry of Vietnam. Coming to Can Tho, visitors will be immersed themselves to the beauty of nature of Southern Delta, a fascinating beauty. Ong Temple, with original name “Quan Trieu Hoi Quan”, is located in 32 Hai Ba Trung Street, Ninh Kieu District, Can Tho City. In the past, this is the temple of Chinese Vietnameses, from Zhaoqing and Guangzhou. Was built in 1894, like other Chinese temples, it is located in the center of the city, in densly populated area. Since its construction until today, the appearance of the Ong temple almost unchanged. The entire architecture was built with a closed hut, perpendicular to each other, inside the temple an open space called the skylight. 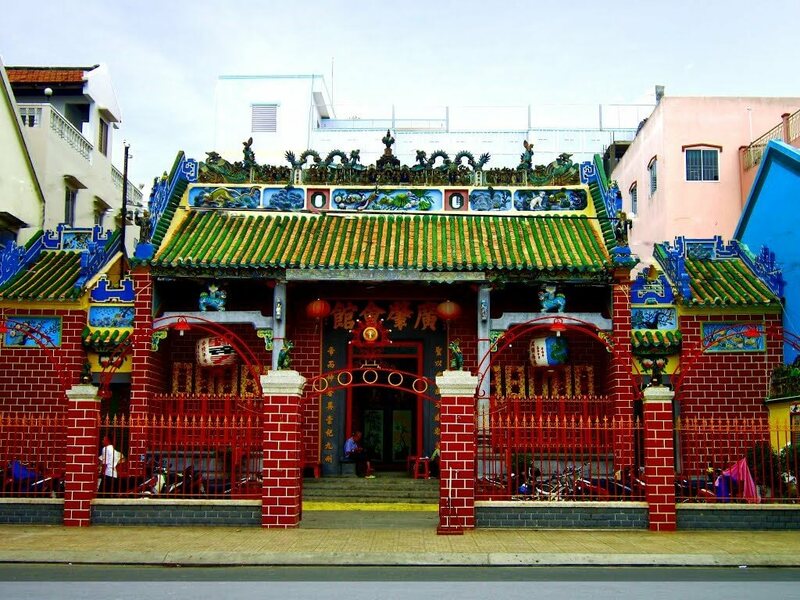 Like many other Chinese temple, it is colorful, cheerful but still remains its ancient beauty. Everywhere in the temple is decorated with many monumental reliefs, brightly color carved picture apricot, orchid, chrysanthemum, architecture, dragon, phoenix, rice flower and the historical references in Chinese literature. Especially, this temple has a bronze bell molded in 1892, by far still resounds when pilgrims visit the pagoda. Visiting Ong Temple, through two rows of Eight Immortals’ weapons, vistors will admire the statue of Guan Gong in the main hall. 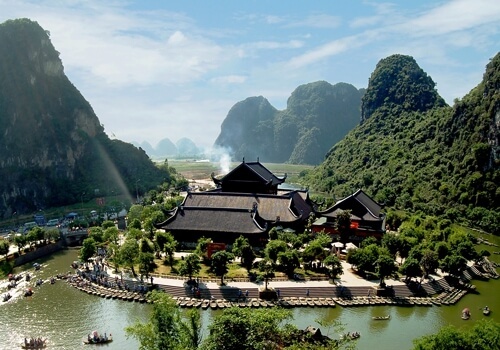 Ong Temple is a historical, cultural relic of Vietnam. 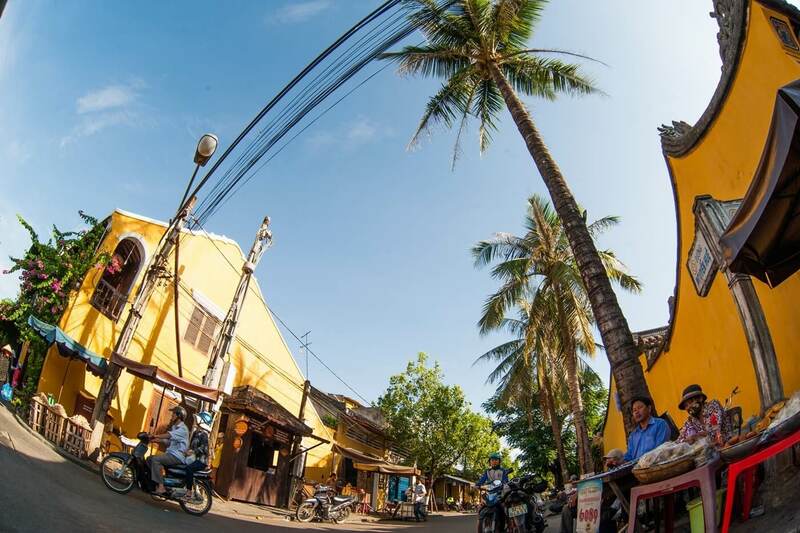 In Can Tho, there are more than 70 old houses with many cultural and historical value. Binh Thuy Communal House is situated right on Bui Huu Nghia street, Binh Thuy Ward. This house is Duong family’s house, was built in 1807, each year welcomes thousands of domestic and foreign tourists to visit. This ancient house has an unique architecture. Designed with French style, this house is a combination of cultural exchanges East - West, expressed through many beautiful motifs. Stepping through the fence gate in French mansion style, visitors encounter a side entrance aligned with the barrier gate, angling to the left of the road, built in oriental architecture. The front yard is large with Chinese bricks, connected to the main house by entrance’s stairs has shapes of a bow. Inside the house this is a large space with luxurious furnitures. Through airy systems of doors and windows, despite the scorching sun but still it is very cool indoors. It is particularly, though the layout and many neck toiletries with Western European style, but most solemn place is still under Oriental worship space. This house also has other nams as Binh Thuy orchid, by bonsai hobbyists 5th generation descendant of the family Duong with many precious orchids and ornamental plants and other rare. Ninh Kieu Wharf, today also known as Ninh Kieu Park, is a cultural destination from 19th century. Ninh Kieu Wharf, which overlooks Hau Giang river, is situated in a prime location, in bank of the Hau River intersection, in the fork of Hau River and Can Tho River, near the center of Can Tho city. Visitors once travel this city, which is in the center of this Western, despite of being busy but still can’t miss the opportunity to come here to watch the pace of vibrant life with crowded boats and the ships left carrier delicacies of the land in South of the country. Alongside Ninh Kieu Wharf is long rows of benches. Every breeze from the river will make visitors feel so relax. In the summer, this is favorite place for children to fly colorful kites, adonres a beautiful corner of the city. 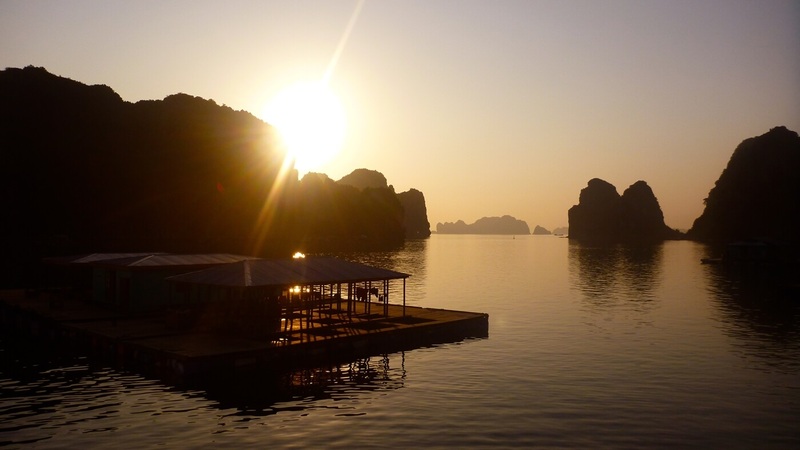 Everyone who has a chance to come here alsway want to once sit on a boat to stroll around Hau river or visit isles beyond it. 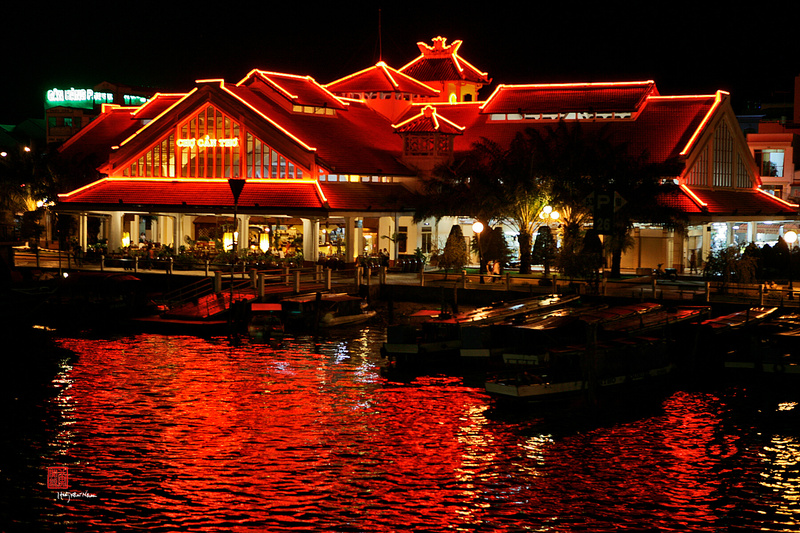 When night falls it is the time that Ninh Kieu Wharf is most beautiful. Colorful lights from two shores reflect into the river, creating a shimmering spectacle. Bang Lang Stork Garden is located in Thot Not district, Can Tho province, about 60 km from Can Tho city. Along the way to stork garden, if visitors asked anyone, they always can give the accurate direction because it has become familiar in the lives of the people here. The owner of this unique garden is a southern farmer, Mr Nguyen Ngoc Thuyen. He said that just about January in 1983, suddenly a flock of ghost storks, a little stork kind with black body and gray wing, contained about hundreds, flew to his garden, filled a vast corner. About a year after leaving, they came back with their friend with the number to thousands in various kinds. Since then, his garden become a refuge for thousands of storks enough categories to make up an ecological garden at random. Tourists always enjoy coming here. In the spring, traveling by boat in stork garden, feeling floating on water, contemplate the landscape painting of purple Lagerstroemia flowers along the waterfront always make tourists very impressive. Bang Lang Stork Garden is really an attractive tourist destination for those who love to explore about nature, like the scene of a serene countryside with rice paddies, bamboo gardens with colorful flamingo flocks. Cai Rang Floating Market is one of the most special tourist destinations in Can Tho. From Ninh Kieu Wharf to Cai Rang floating market is about 4 km. Cai Rang market meets early, from morning and until about 9 am. Around 6 am, hundreds of small boats are parked close together for the sale. The unique features and key characteristics of Cai Rang floating market is specialized in trade of fruits, specialties of the Mekong Delta. The store or small boats often have no sign, hangs products on a pole or on the boat. They call this tree the "tree fat". 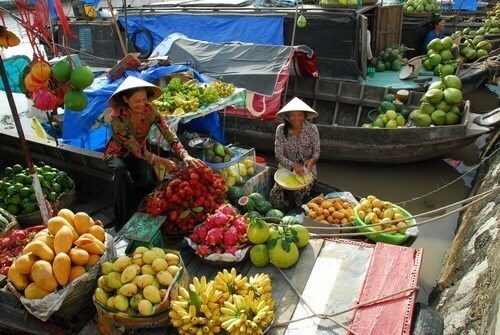 The unique features and key characteristics of Cai Rang floating market is specialized in trade of fruits, specialties of the Mekong Delta. The store or small boats often have no signs that hang products on a pole that or on the boat. Today, because of the needs of people, many different types of services such as pho, noodles, coffee, floating pubs ... are born. The boats are ready to crept around to cater visitors in dedicated and thoughtful ways. Cai Rang Floating Market is a special place, makes the trips of many tourists poetically, by the unique culture of the people in buying and selling products. Cu Chi Tunnels, a defensive system in the ground in Cu Chi District, is about 70 kilometers from Ho Chi Minh City to the northwest. This tunnel stretches over 200 km, spreads like cobwebs. This tunnel system includes underground a clinic for sodiers, many rooms, kitchen, storages,… It was built on land known as the "land of steel", at the end of the Ho Chi Minh Trail. It was dug on an area of land with high reliability. Tunnel system is located deep underground, can withstand against destructive power of the largest bomb of the US Army. For people to live here, air is taken into the system through the vents. Most areas of the tunnel can be isolated when necessary. More than 20 years of construction, the Cu Chi tunnels were completed not by a modern technique that is from the hand of those who decided to preserve every inch of homeland. Cu Chi was "home" of hundreds of soldiers with smart guerilla style has repeatedly made American imperialist terror, contributing to the cause of freedom for the homeland. 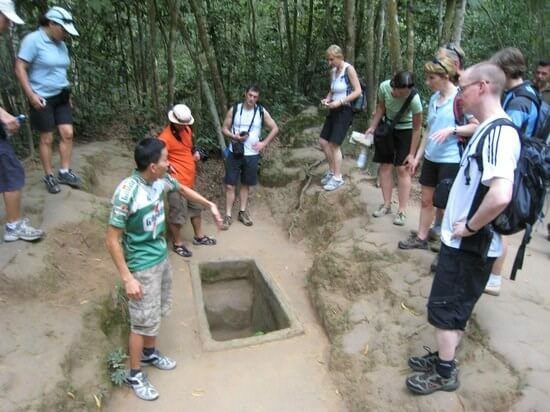 Today, there are about 120km of Cu Chi tunnels is protected, has become an attractive tourist destination for travelers visiting Ho Chi Minh City to experience life underground tunnel like the real residents ago.